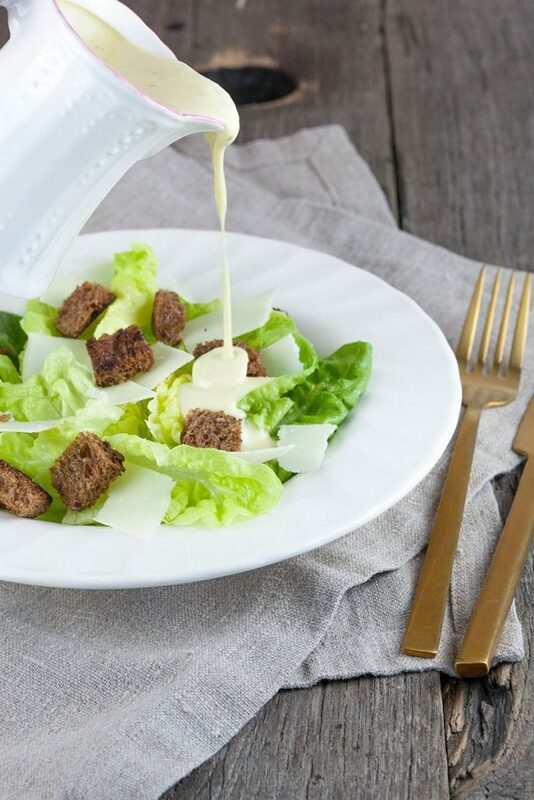 In just 20 minutes you can whip up a classic caesar salad. This dish originates from Mexico and can be found in virtually every restaurant these days. RINSE the two little gem lettuces, remove its roots and dry the leaves using a salad spinner or a clean kitchen towel. Set aside. GRATE about 80 grams of parmesan cheese and set aside. Let’s make the caesar salad dressing! FILL the small pan with water and bring to a boil. BOIL the eggs for two minutes, giving it just enough time to let the egg whites solidify. REMOVE the pan from the stove and stop it from cooking further by putting the pan under cold, running water. REMOVE the egg from its shell using a little spoon. PEEL 2 cloves of garlic and add into your blender along with the eggs, juice from 1/2 lemon, parsley, Dijon mustard and anchovy. BLEND the ingredients for about 3 minutes while gently drizzling 1.5 dl (0.63 cups) olive oil into the mixture.ADD about 80 grams of grated parmesan cheese and season the dressing with some salt and pepper. PEEL the remaining clove of garlic and slice into rough chunks. SLICE off the crusts from the bread, then slice the bread into small squares. HEAT up some olive oil in the medium-sized skillet. ADD in the chunks of garlic and cook for 2 minutes. REMOVE the garlic and add in the pieces of bread. COOK until crisp, while turning them around every now and then using a spatula. REMOVE from the pan and remove excess olive oil by placing the bread on a few layers of paper kitchen towel. 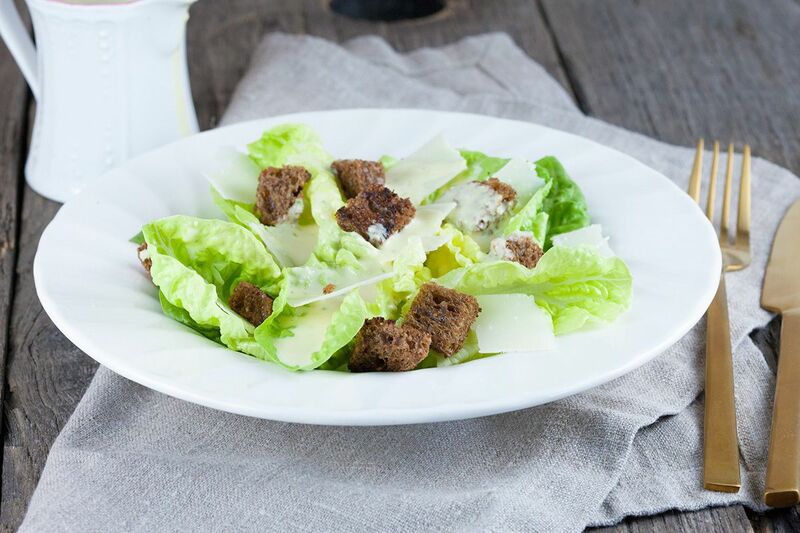 RIP the salad into bite-sized chunks and slice off thin, long strips of parmesan cheese. 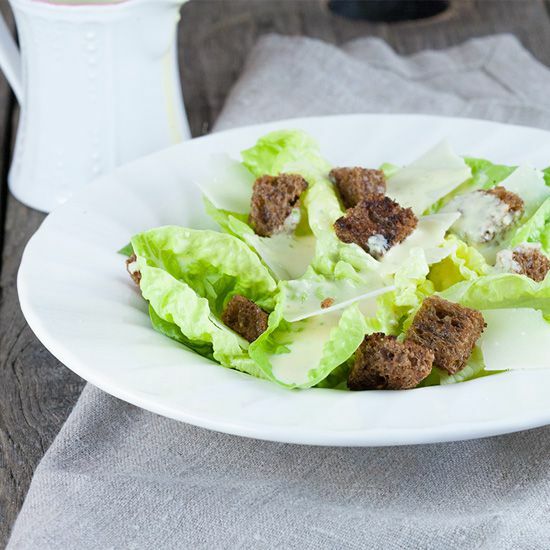 DIVIDE lettuce leaves over two plates, add dressing and toss well. ADD the garlic bread, parmesan cheese and optionally more anchovy fillet to liking.